I don't think any city on earth boasts beaches and scenery as lovely as Cape Town's Atlantic Coast. I've visited Rio and other cities with legendary coastlines but this is in a class of its own. 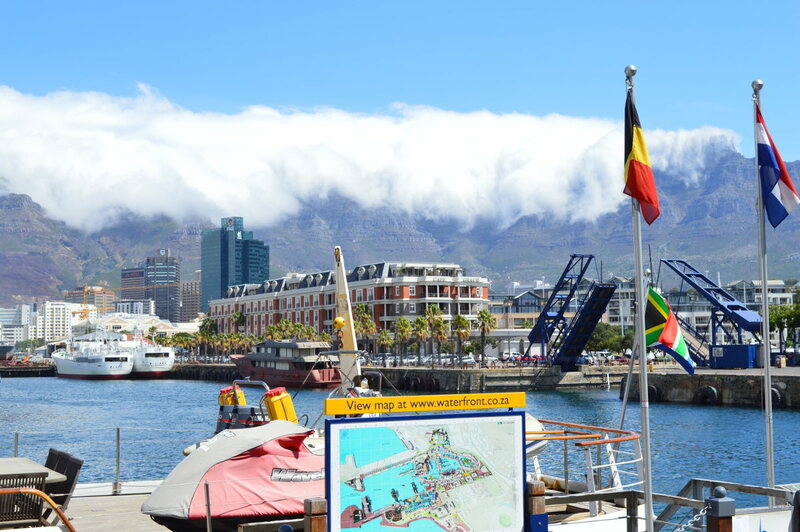 View of Table Mountain with its "Tablecloth" from the Waterfront. Should you wish to base yourself in the Waterfront area then my choice would be either the Victoria & Alfred (four stars but better than many five stars) or the Breakwater Lodge (great value). Just outside the Waterfront there is an apartment that I often stay at which is worth considering called the Cascades. It's near Giovanni's too - the best deli in the city. 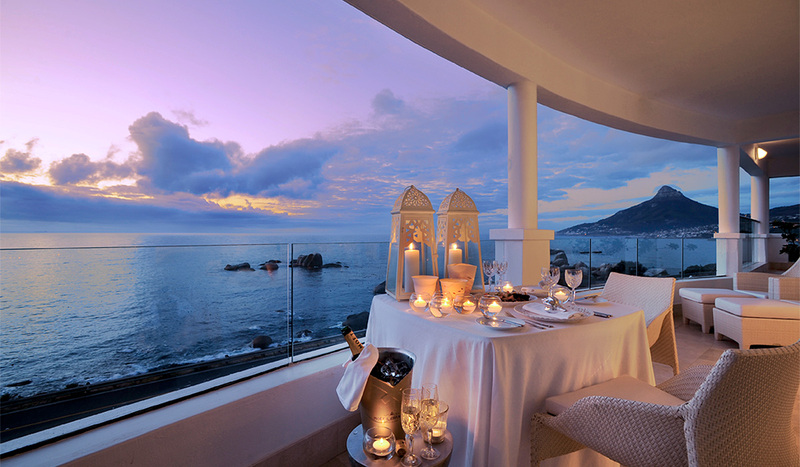 If you'd like to make the most of the spectacular coastline, and in absolute luxury, then nowhere else can beat the Twelve Apostles Hotel & Spa - it came top of our list of the best hotels in Cape Town. There's nothing like waking up and seeing the spectacular ocean views and then ending the day, sipping a cocktail on the terrace of your room, while the sun sets over the Atlantic. 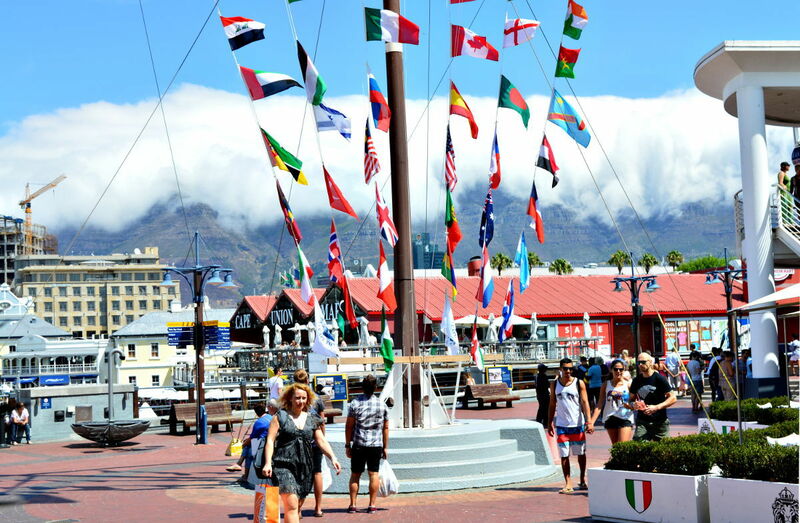 The Waterfront is well worth a visit with lots of great shopping, restaurants and a fun atmosphere. They've even a Big Wheel - a smaller version of the one in London. The views from the top of sea, mountain, and city are something you'll remember forever. One thing you really have to do is visit the aquarium - they've some spectacular tanks that take you into the underwater world beneath the seas off Cape Town. The forests of kelp are like nothing I've ever seen before. 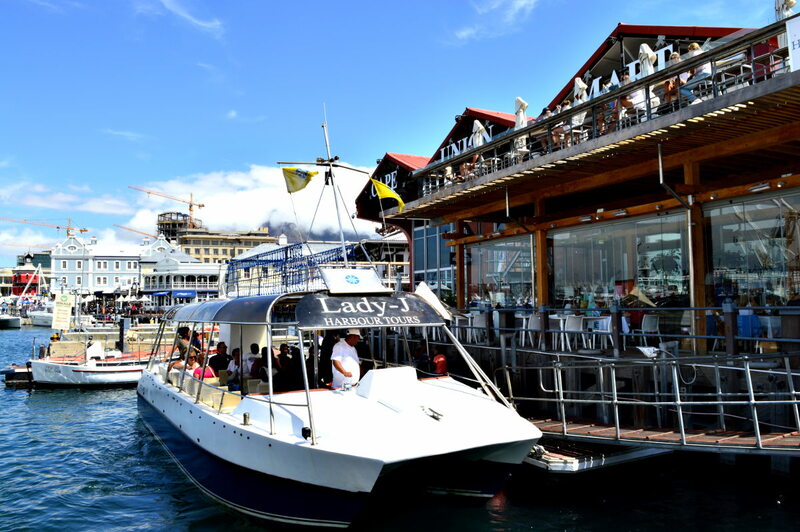 Make sure you take one of the boat trips around the harbour and enjoy the awesome views of Cape Town; seals keep watch on your progress as they laze about on the docks. Come evening and the Waterfront is abuzz; restaurants entice you with aromas of countless cuisines, jazz drifts through the air on the warm summer breeze and cocktails are sipped while watching the African sun slip below the horizon in a blaze of colour. Trouble with the Waterfront is that there is so much to do you could spend days here and never get to the beaches so a bit of willpower is required. 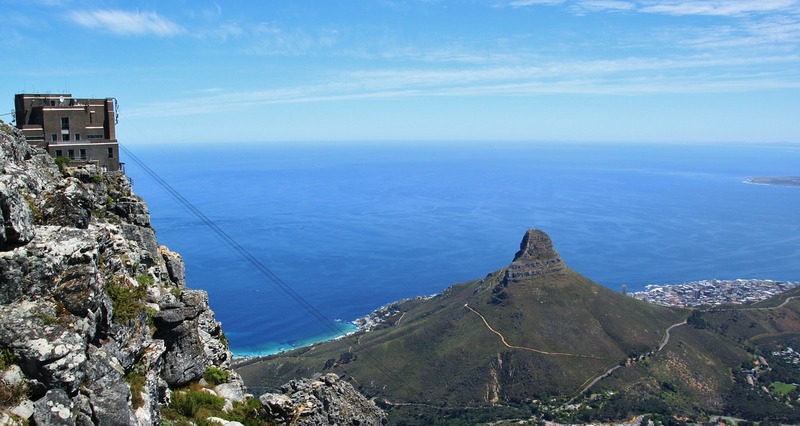 To really understand how spectacular Cape Town is, and to get an idea of how the coastline all fits together, you absolutely have to take a trip up Table Mountain - view our Table Mountain article for details. 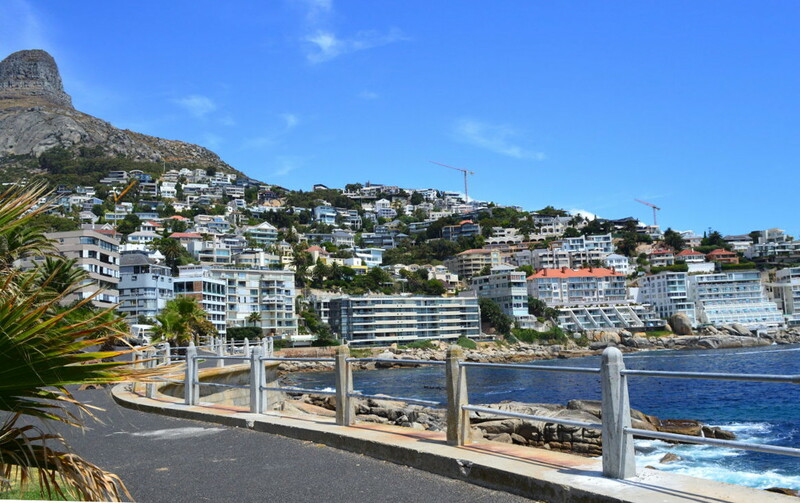 As you leave the Waterfront, heading for Clifton, you'll pass through the suburbs of Seapoint and Bantry Bay. 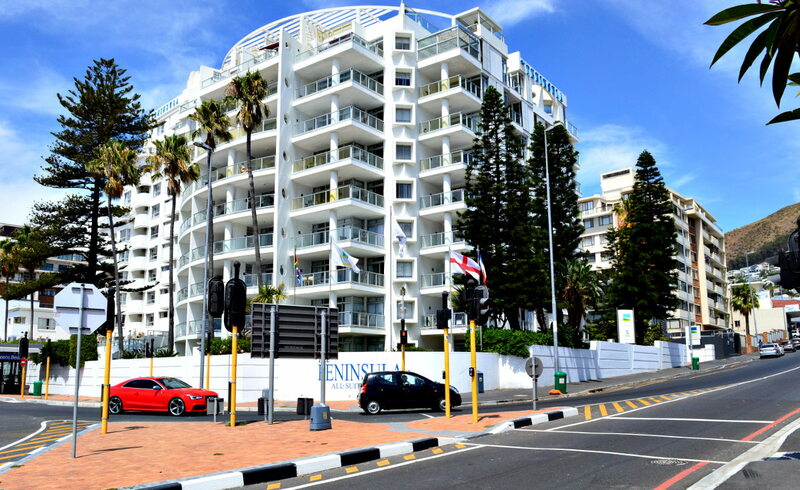 Seapoint in particular is a lively area with an eclectic mix of people and a lot of restaurants and bars. It is home to one of South Africa's largest Jewish communities and because of their influence Seapoint is where you'll find the best homemade bagels in South Africa - try Goldies at 174 Main Steet or Kleinsky's Delicatessen at 95 Regent Street. 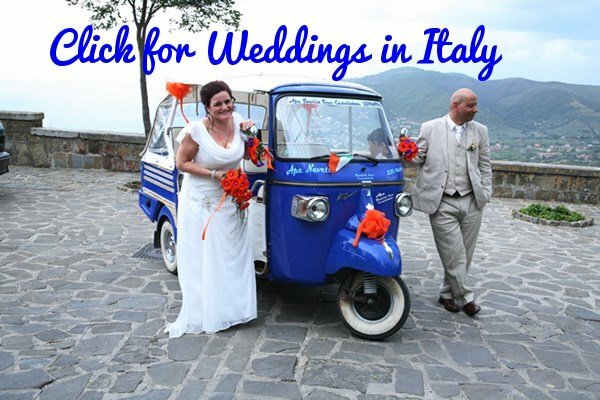 You'll need a car to really explore - here is the best value option. Once you're in your car head out of the city and within ten minutes you're climbing the mountain side into a neighborhood that looks like the Amalfi Coast meets Beverly Hills. Here million dollar ocean front mansions perch precariously on cliffsides overlooking an ocean of sapphire blue. Driving along you'd probably not even realize that down below the road lie some of the world's best beaches. 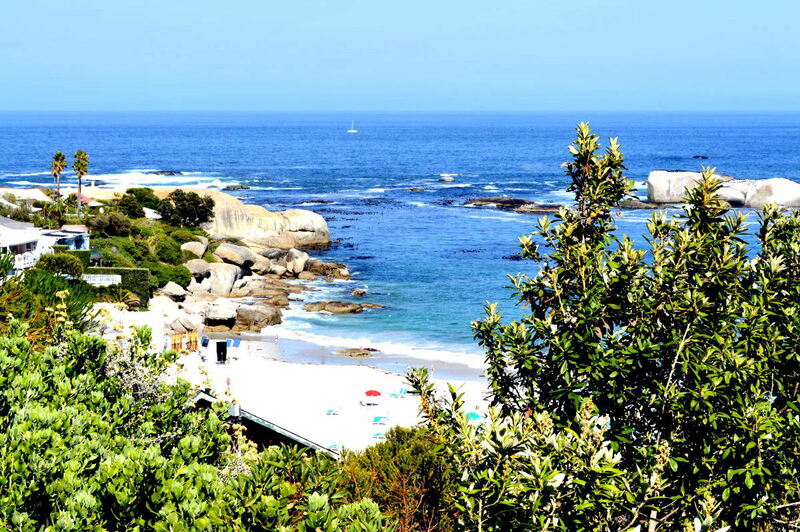 These are the Clifton Beaches, included in the global top ten year after year. Not just my rankings, but those of big authoritative websites like Travel & Leisure and National Geographic. Make sure you stop off and explore them all - click to begin. 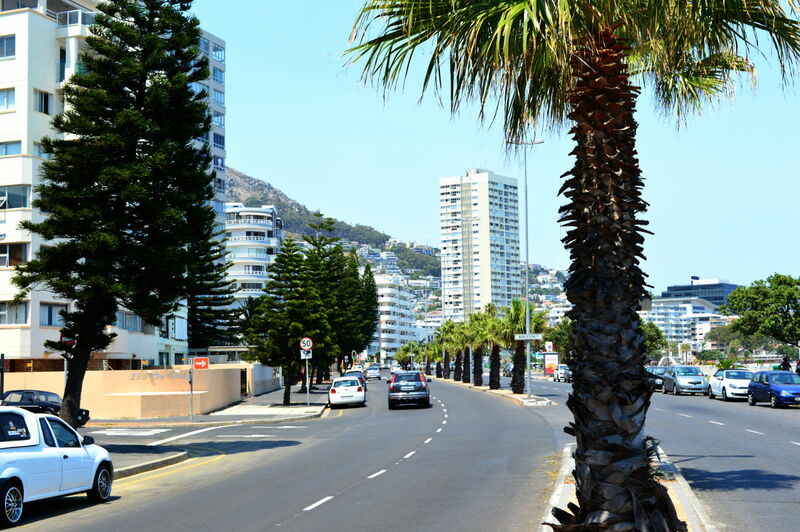 Once you're done with Clifton (you're never really ever done with Clifton – the longing to return remains forever) get back in the car and drive down to Camps Bay. As you turn the corner from Clifton you'll get a first glimpse of this beach lined with palms, and with the Twelve Apostle mountains behind . No matter how many times I see it I still get goose bumps. 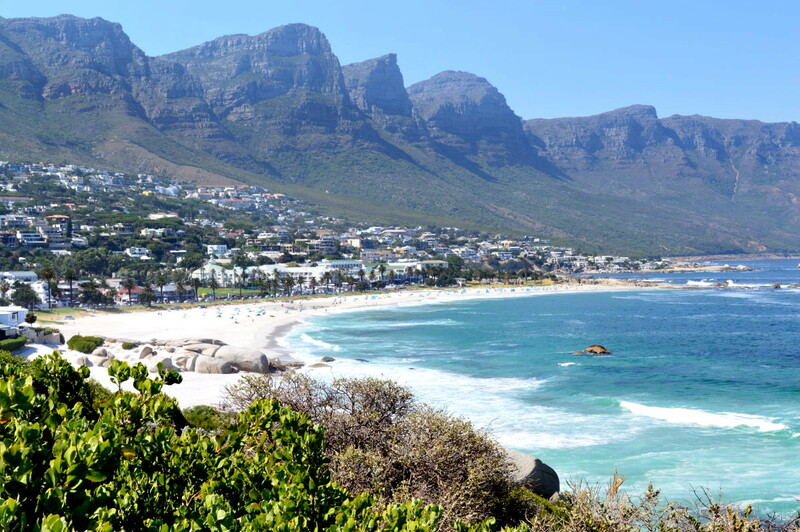 Discover more about Camps Bay here. Named after a seaside town in Wales, this Llandudno has lots of sunshine and palm trees while the other has a little less of both. Apart from that they are the same – at least in the eyes of whomever gave the town its name...mmmm. To get here you keep on following the coast from Camps Bay, up along a road set right against the cliffs; anywhere you look the view is outstanding. After around two miles of climbing higher and higher there is a little road on your right leading to the sea far below. Turn down here and you're in Llandudno. It's worth coming here for the setting alone, however you'll not be disappointed with the beaches. The main one is loved by surfers and is gorgeous, although the sea is too rough and cold for swimming in. The other one is often full of naked people. Here's all you need to know about Llandudno. Leaving Llandudno and climbing back up to the coastal road you'll soon find yourself heading down the towering hillsides above Hout bay. Once you arrive you'll find a little fishing port and a restaurant selling the freshest of seafood. 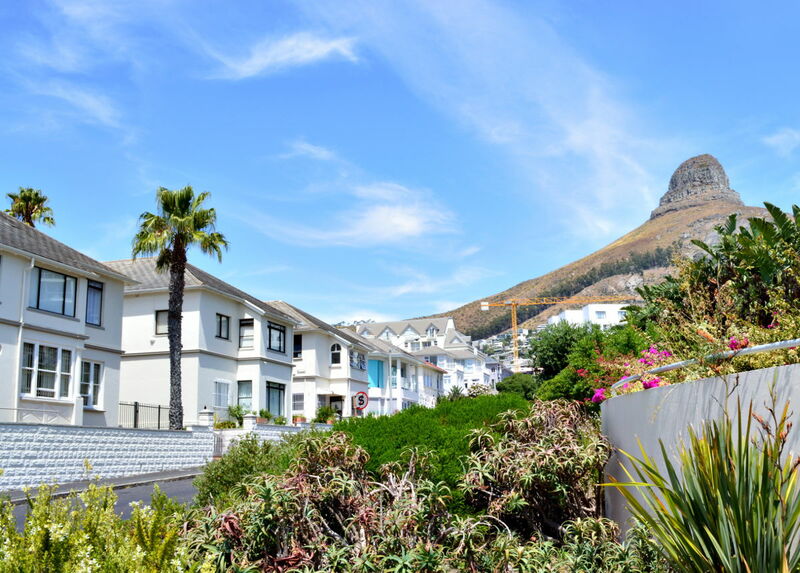 Hout Bay (read more here) is definitely somewhere to linger. 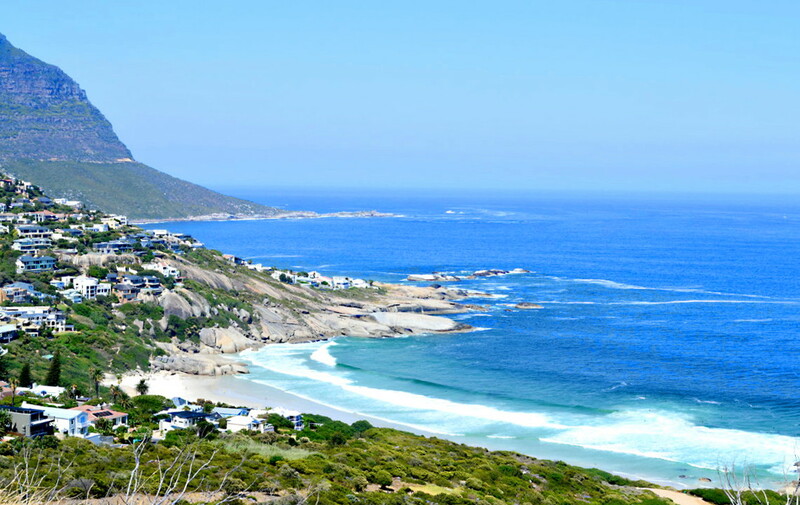 One of the greatest ocean drives anywhere on earth which starts straight after leaving Hout Bay and ends off with the view of enormous Noordhoek Beach (see photo below). 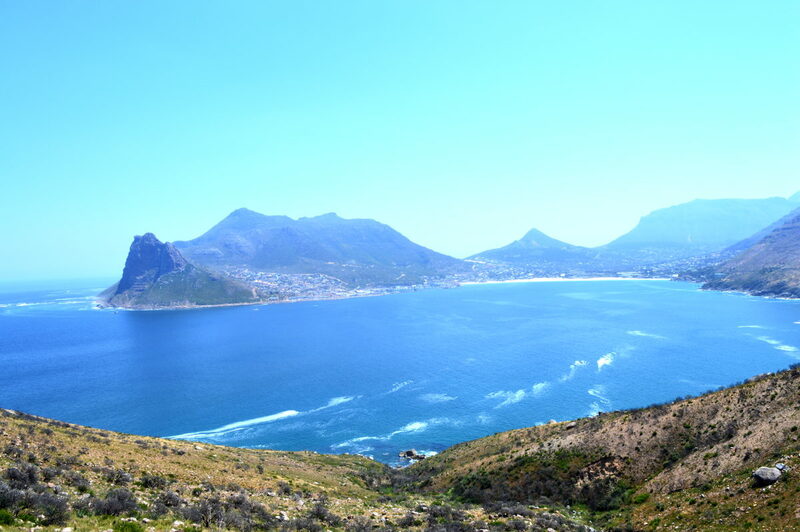 Make sure you stop at the view points and look back the way you've come - the view of Hout Bay behind you is phenomenal. Ready to enjoy the drive - click to begin. At the other end of Chapman's Peak Drive is Noordhoek with one of the biggest beaches I've ever seen. Even the racehorses that exercise here look like ants as you descend down from Chapmans Peak Drive to this huge expanse of talcum powder sand. 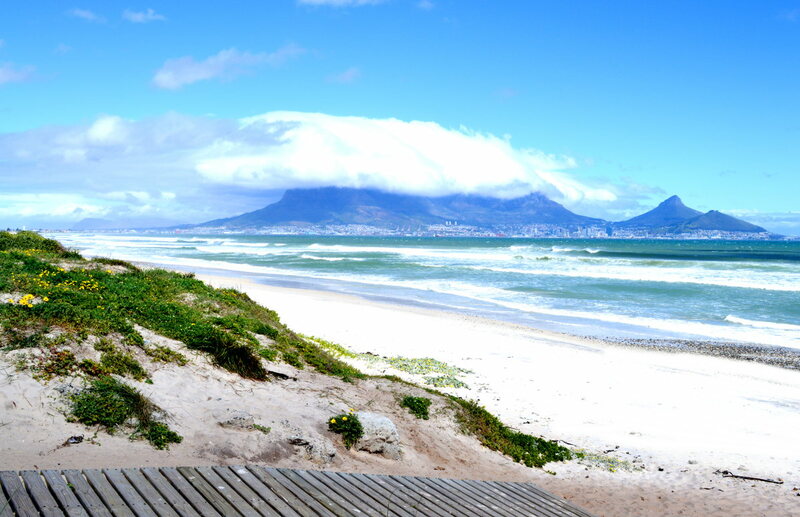 Definitely one of the best Cape Town Beaches. 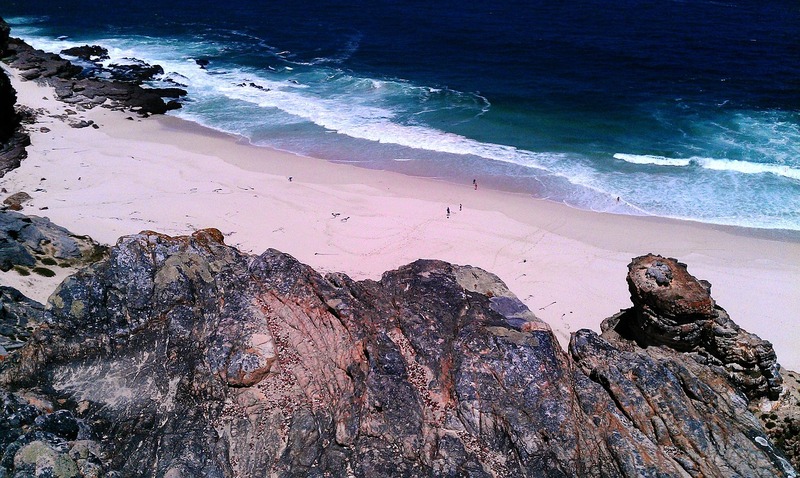 Here's more on Noordhoek. 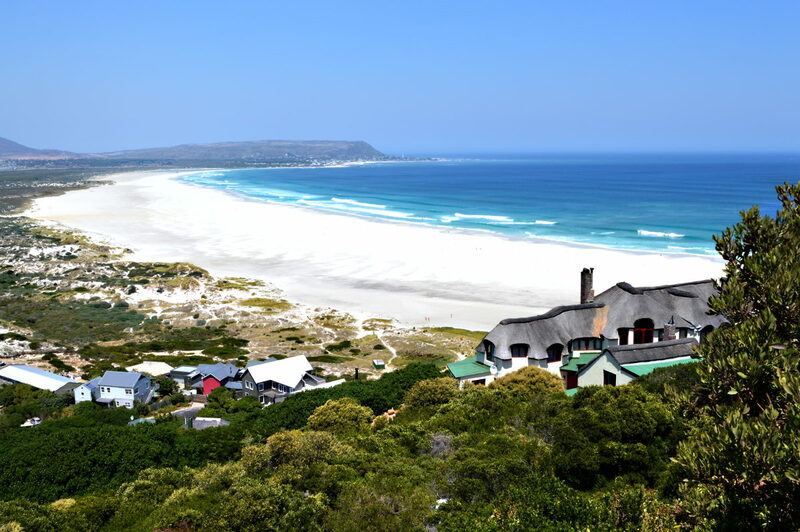 Carry on past Noordhoek and you soon reach Misty Cliffs and Scarborough - click for more. It's only a short way out of Cape Town yet it feels a thousand miles away. This truly is a little haven tucked away from the world and it is home to Cape Town's most famous veggie burger - read the article to see what I think of it. They say this is where the might of two oceans meet and the sight of a tumultuous sea stretching off into the blue yonder, with only the Antarctic any farther south, makes this a very special place indeed. Discover hidden coves, with gorgeous empty beaches; often your only company will be the ostriches, antelopes and baboons. 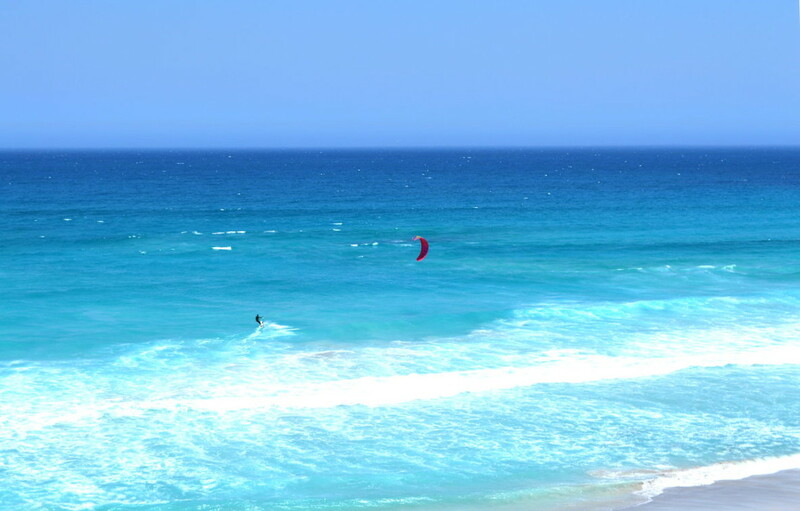 For anyone who loves endless beaches, kite surfing and old-fashioned surfing Big Bay is a mecca. Even if you hate beaches you can't help but love the iconic view of Table Mountain from here. It's the best place in Cape Town to watch the sunset from too and there's a wonderful spot to do it from - you'll find the details in our guide to the beach. Travel an hour from Cape Town and you'll come upon another world entirely. Here things are far drier and the scenery is more that of Sardinia. Langebaan itself is a lovely little beach-side town on the edge of a lagoon of world-wide importance and with a great golf course - here's more on the town. 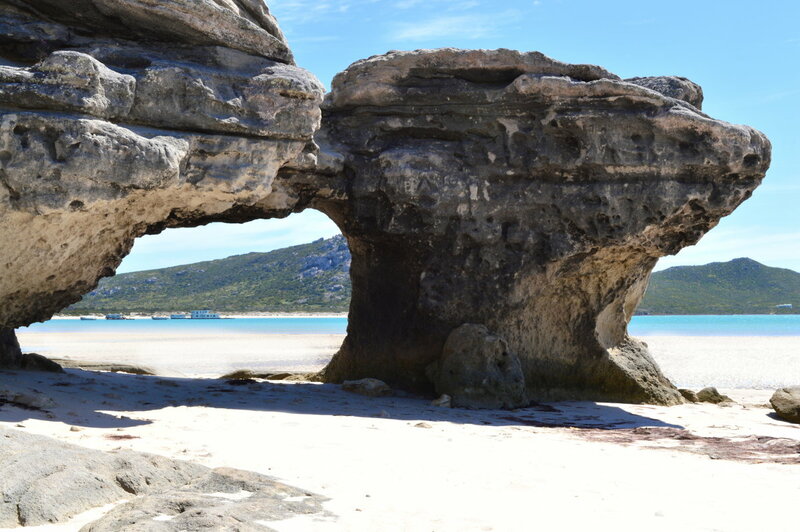 Langebaan's ocean lagoon, set within the West Coast National Park, is a spectacular destination. The ocean in the lagoon is tinted a thousand shades of blue and if you are lucky enough to visit in spring the shores are decorated with wild flowers of breathtaking beauty. Still not enough for you? How about spectacular beaches where ostriches and zebras roam the shores and flamingos fly past in ranks of pink? 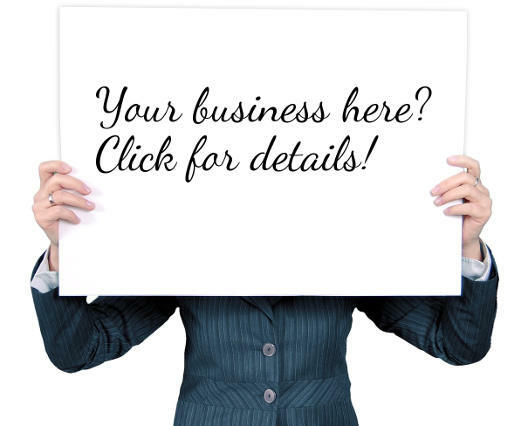 For even more reasons to visit click here. 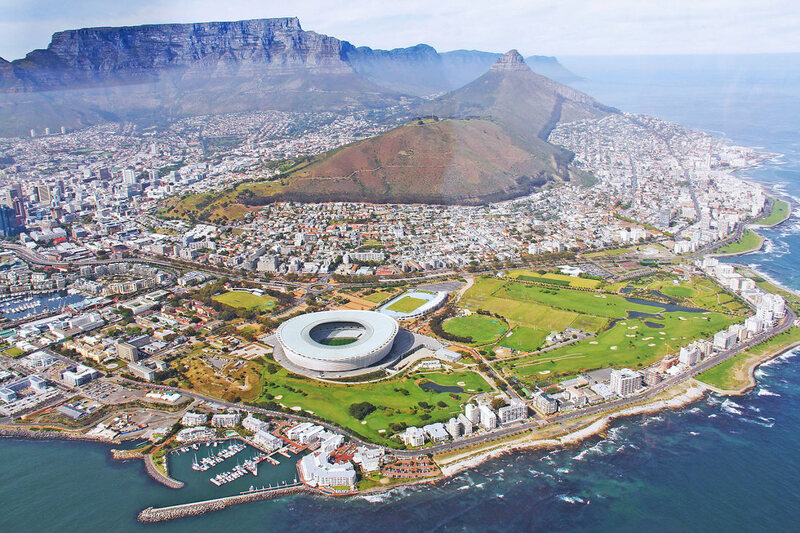 There are a huge number of tours in and around Cape Town - here are some good ones.